Walk past Pho Bo Ga Mekong Vietnam on Swanston Street at any time in the day or night and you'll find the place busy with diners from all walks of life and cultures. I finally decided to follow the crowd and headed into this popular eatery with the view that that many hungry people in Melbourne can't be wrong. Walking into this casual restaurant brought back memories of street-side shops in Ho Chi Minh City in Vietnam with its tuckshop centrepieces of chopsticks and sauces on each table. 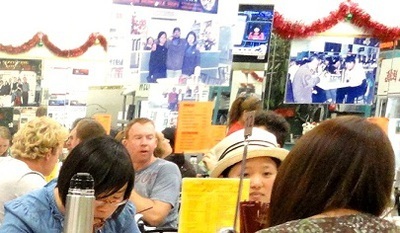 The wall covered with mirrors, television sets hanging off the walls with news and entertainment programs from Vietnam, laminex tables and menu remind of similar Vietnamese eateries I'd visited in Sydney and Perth. Plaster across the wall mirrors are pictures taken of and with famous Chinese movie stars like Jackie Chan and Sammo Hung from Hong Kong. I was ushered to a shared-table with clinical efficiency, cramped in and surrounded by fellow diners slurping away at noodles and rolls while participating in high-decibel conversations. Not a great way to start an enjoyable meal but these characteristics were the standard setting of Mekong Vietnam. Tight-spaced and noisy eating environment aside, it was time to do some serious tasting and find out if the crowd was right. I decided on the special beef pho which featured a mix of beef slices, beef balls and offal. Before the star trek enterprise could engage warp speed, the steamy hot pho arrived, accompanied by a plate of raw beansprouts topped with fresh Thai basil. The portion of pho was sizable and the ingredients looked attractive. Unfortunately the taste test was a 100 metre dash in the opposite direction. All three components of the beef pho were skewed - the broth was too sweetly ladened with monosodium glutamate and lacked any distinct beef stock flavour; the rice noodles were too soft and broke easily when held with the chopsticks; the beef pieces tasted flat. I had way better beef pho at Pho TK in Sydney, Tra Vinh in Perth and even modern-Vietnamese Miss Chu in Melbourne. I was wondering if the crowd understood the difference between a proper Vietnamese beef pho and a crappy version. Setting aside the half-consumed pho, I decided to try the vermicelli with grilled pork and spring roll. A generous portion of thin rice noodles topped with roughly sliced cucumbers and carrots with 6 deep-fried spring roll halves and chopped pieces of grilled pork arrived again in quick time. This cold noodle dish paled in comparison to the Vietnamese vermicelli salad I'd tasted at Pho TK and Pho Toan Thang in Sydney. The grilled pork was burnt and the loosely-filled spring rolls were limp. However, it was far better than the special beef pho. Despite the poor attempts at offering authentic Vietnamese beef pho, there are still upsides to this eatery that are likely drawing new and return customers. Orders are executed and delivered with speed that are appreciated by customers short on time. Chinese tea and tap water are offered freely. The price is kept at an affordable AUD10 and below. So if you're looking for basic hot food in hotly contested tables and seats at hot prices delivered at rubber-burning speed, then Pho Bo Ga Mekong Vietnam may still be the eatery for you. I couldn't agree more -- I have visited many times over the years and if it wasn't for the central location on the State's busiest street, Mekong Vietname restaurant wouldn't have a single customer -- there are many better options in Melbourne CBD, but your best bet is to visit Springvale, Vic. St Abbottsford or Footscray for hundreds of authentic restaurants with really tasty Pho and other great dishes.